In any sport, improvement is the name of the game, and the Binghamton women’s basketball team is no exception. In the 2015-16 basketball season, the Bearcats were 14-17 overall and 8-8 in America East (AE) conference play. The team followed the trend in the 2016-17 season with an overall record of 13-17 and a conference record of 8-8. However, in the 2017-18 season, improvement became the word that defined the season. The Bearcats turned their losing record around and held a 20-12 overall record and a 10-6 conference record. With the improvement of the Bearcats’ record came more accomplishments during the 2017-18 season. Last season marked the first time in Division I history that the women’s basketball team was the favorite in a playoff game, and the Bearcats are looking to do much of the same this season while improving their overall and conference records to become a top seed in the conference. With some of the top players and former BU head coach Linda Cimino absent from the roster this season, Binghamton will have to cope with the changes ahead. After Cimino stepped down and took a head coaching position with St. Francis in Brooklyn, New York, Bethann Shapiro Ord assumed the role of BU head coach following several years coaching at Weber State. Before Shapiro Ord’s arrival at Weber State in 2011, the team had not won more than 10 games in the three years prior. 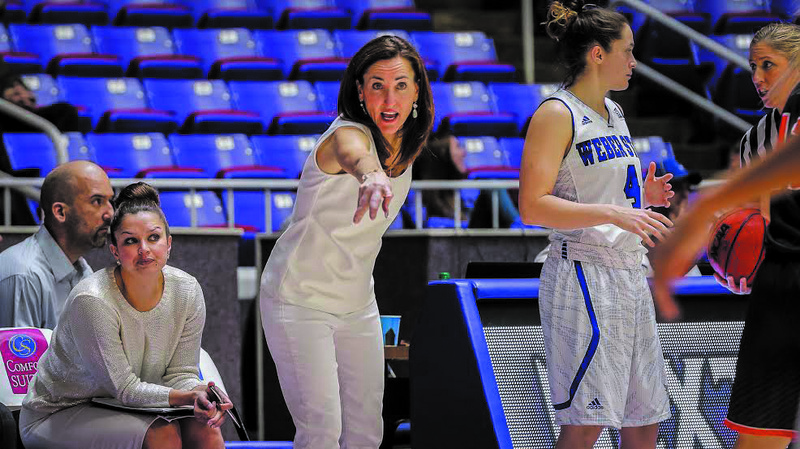 After Shapiro Ord’s hiring, she was able to attain the highest win total in program history during the 2015-16 season with 23 wins, and advance her team to the Women’s Basketball Invitational twice. Her team was also No. 9 in the country in total steals, with 366 during the 2015-16 season. Before Weber State, Shapiro Ord spent 22 years as assistant coach for several Division I basketball teams and was a Division I player herself as a three-year starting point guard at UMBC. After graduating in 1989, Shapiro Ord began her coaching career as an assistant at Nazareth College. With a slew of the experience and accomplishments behind their new head coach, the Bearcats could be in great shape for the upcoming season. Although Imani Watkins, ‘18, who holds the record for highest scorer in program history, and Alyssa James, ‘18, who holds the program and AE records for the most blocks, graduated from Binghamton, there are a number of returning and new players who pose a threat to AE competition. Out of the returning players, junior guard Kai Moon, senior forward Rebecca Carmody and junior guard Carly Boland are three of the players who have shown their skill and dexterity time and time again. With these returning players and some new up-and-comers, such as freshman guard Annie Ramil, sophomore forward Olivia Ramil and the experience of Shapiro Ord, the women’s basketball team is looking to improve on a game-by-game basis this season. “It’s not going to be overnight, and it’s been a process, but just as long as we keep improving — little improvement is good improvement — and that’s the biggest thing that I want,” Shapiro Ord said.